Home » What is Organic? Organic farming uses the earth’s natural resources for sustainability. It emphasises appropriate land management and aims to ecologically achieve the balance between animal life, the natural environment and food crops. Organic farmers do not use pesticides, herbicides, genetically modified foods, growth promoters or hormones. 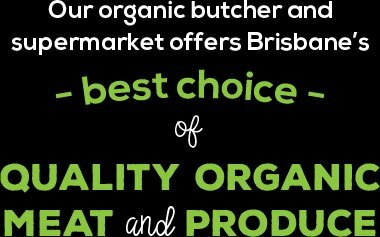 Organic meats such as organic chicken, organic beef, organic lamb and organic pigs come from animals that are given no antibiotics or growth hormones. The produce that is produced through organic farming is therefore in its most natural form. Organic farming is not only more humane, but also better for the environment than conventional farming. There has been evidence of widespread environmental damage due to conventional farming and the use of pesticides, herbicides and synthetic fertilisers. Salinity, blue-green algae in waterways and soil fertility decline are just some of the examples of land degradation. Before a product can be labelled “organic”, a Government-approved certifier inspects the farm where the food is grown to make sure the farmer is following all the rules necessary to meet FSANZ (Food Standards Australia and New Zealand) organic standards. Companies that handle or process organic food before it gets to you or your local organic supermarket or restaurant must be certified, too. The only way consumers can be assured that they are purchasing real organic products is to purchase products which have been organically certified with a recognised AQIS approved certifying body. The Meat-ting Place is Certified with Australian Certified Organic (ACO), an approved certifying body with AQIS and is a subsidiary of the Biological Farmers of Australia (BFA). Eat organic, it’s good for you. Please contact us for your nearest outlet.